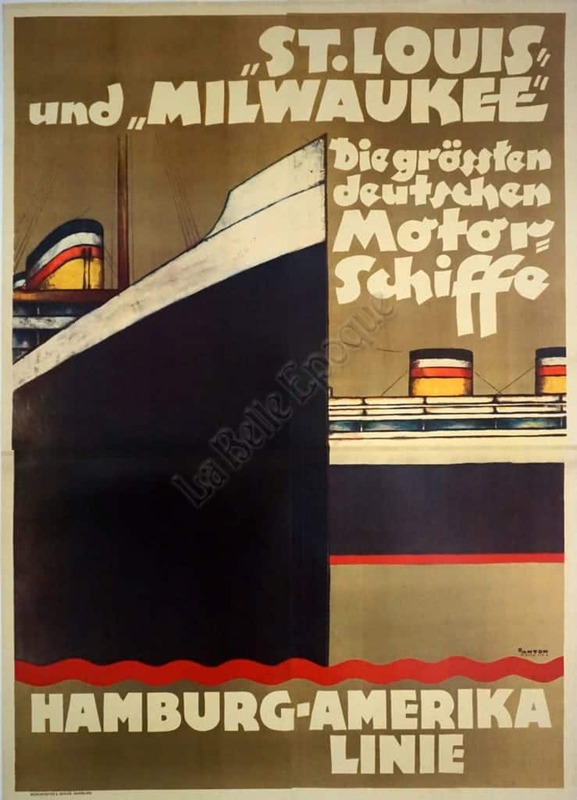 This is an extremely rare four-sheet German Art Deco period poster for the Hamburg-Amerika Line, and for the specific transatlantic liners “St. Louis” and “Milwaukee.” This wonderfully Art Deco image, created by Ottomar Anton, features one ship jutting out into the center foreground of the poster, with the other positioned horizontally behind it. Each transatlantic liner features a black hull with white detailing at the top of the ship and stripes of the colors of the German national flag – black, white, red, and yellow – composing the stacks. This poster features a gold background with red lines delineating the bottom of the image, lines that also create an abstract representation of where the ships meet the ocean. Bold while block lettering is seen at the top, reading “‘St. Louis’ und ‘Milwaukee'”; right below this, “The largest German motor ships,”; and at the very bottom of the poster, “Hamburg – America Line.” The use of bold colors and shapes in this Art Deco period poster exquisitely captures the machine age aesthetic, emphasizing the scale and power of modern technology. Ottomar Anton was a German painter, graphic artist, lithographer, and university lecturer. He was the head of the Arno Kypke studio in Hamburg after World War I, and created his own graphic design business in 1921. He is primarily know for his numerous posters for shipping companies. Interestingly, Anton also created the logo for 4711 Eau de Cologne which is still used to this day. In one of the company’s less proud moments, the St. Louis was involved in one of the most shameful events of the Second World War. In 1939, the St. Louis set sail from Hamburg across the Atlantic to Havana, Cuba, carrying over 950 Jewish emigrants fleeing Nazi tyranny. Unfortunately, the passengers of the St. Louis were turned away by officials of both Cuba and the United States, forcing the liner to return to Europe and the dangers of Nazi persecution. This poster was printed by Muhl Meister & Johler, Hamburg, 1929.